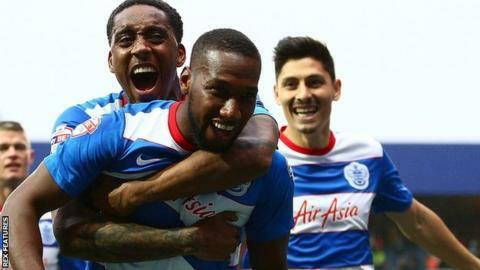 Queens Park Rangers scored three times in the final 20 minutes to see off MK Dons and record just a second win in eight Championship games. Having enjoyed the majority of possession and chances throughout, Jay Emmanuel-Thomas set Rangers on the way with a skilful run and shot. Matt Phillips cut inside to add a second with 13 minutes to play before Junior Hoilett hooked home late on. The Dons have now lost eight of their last 10 league matches. R's boss Chris Ramsey said he understood the criticism of fans in the lead up to the game and his side responded with a largely dominant performance. Paul Konchesky's burst into the box brought the best chance of the first half, although Kyle McFadzean got back to clear away the effort for the Dons. Grant Hall's header over from a Phillips delivery continued the rhythm, while at the other end keeper Rob Green remained sharp to stop Simon Church's smart turn and shot. But when it looked as though Rangers would again be frustrated, Emmanuel-Thomas tricked his way into the box before sliding the ball beyond keeper David Martin. Church failed to meet a Josh Murphy cross and Dons were made to pay when Phillips smashed home after outfoxing Murphy, and Hoilett's third ensured the scoreline reflected the hosts' superiority. "We were on top for most of the game but didn't take all our chances and when you play against a team that pass the ball like MK Dons you know there's always a chance of them getting in behind you. "We stuck at it and we got another clean sheet, which is important for us because we know if we can do that we are capable of scoring goals. "We're still in the gelling process and that's something people have to realise. But we will get it right." "We needed to be more ruthless with our finishing and our defending. We switched off in the last 20 minutes and it cost us the game. I think sometimes we think we can switch off in games if things are going quite well for us, and we can't do that. "I was disappointed that at 1-0 down we didn't stay in the game for longer and then try to capitalise on any mistakes QPR might have made. We conceded another goal quite quickly. "But we'll stick together and will move forward. We're punching above our weight and our players are having to constantly work hard, which people understand. QPR didn't really play any football, and at no stage of that game were we outplayed." Match ends, Queens Park Rangers 3, MK Dons 0. Second Half ends, Queens Park Rangers 3, MK Dons 0. Corner, Queens Park Rangers. Conceded by Antony Kay. Attempt saved. Leroy Fer (Queens Park Rangers) right footed shot from the centre of the box is saved in the bottom left corner. Assisted by Junior Hoilett. Corner, MK Dons. Conceded by Paul Konchesky. Corner, MK Dons. Conceded by Alejandro Faurlin. Attempt missed. Jay Emmanuel-Thomas (Queens Park Rangers) left footed shot from the centre of the box is close, but misses to the left. Assisted by Junior Hoilett. Goal! Queens Park Rangers 3, MK Dons 0. Junior Hoilett (Queens Park Rangers) right footed shot from very close range to the top right corner. Assisted by Clint Hill with a headed pass following a corner. Attempt blocked. Grant Hall (Queens Park Rangers) header from the centre of the box is blocked. Assisted by Daniel Tözsér with a cross. Substitution, Queens Park Rangers. Alejandro Faurlin replaces Karl Henry. Corner, MK Dons. Conceded by Clint Hill. Attempt blocked. Simon Church (MK Dons) left footed shot from the left side of the box is blocked. Assisted by Carl Baker. Attempt blocked. Junior Hoilett (Queens Park Rangers) right footed shot from outside the box is blocked. Assisted by Leroy Fer. Leroy Fer (Queens Park Rangers) wins a free kick on the right wing. Substitution, Queens Park Rangers. Junior Hoilett replaces Tjaronn Chery. Attempt missed. Tjaronn Chery (Queens Park Rangers) left footed shot from the left side of the box is high and wide to the right. Assisted by Paul Konchesky. Substitution, MK Dons. Nicky Maynard replaces Diego Poyet. Goal! Queens Park Rangers 2, MK Dons 0. Matthew Phillips (Queens Park Rangers) left footed shot from the right side of the box to the bottom left corner. Assisted by Daniel Tözsér. Corner, MK Dons. Conceded by Matthew Phillips. Attempt blocked. Josh Murphy (MK Dons) right footed shot from outside the box is blocked. Assisted by Samir Carruthers. Corner, MK Dons. Conceded by Robert Green. Goal! Queens Park Rangers 1, MK Dons 0. Jay Emmanuel-Thomas (Queens Park Rangers) left footed shot from the centre of the box to the bottom right corner. Assisted by Nedum Onuoha. Offside, Queens Park Rangers. Leroy Fer tries a through ball, but Paul Konchesky is caught offside. Attempt missed. Daniel Tözsér (Queens Park Rangers) left footed shot from outside the box is high and wide to the left from a direct free kick. Kyle McFadzean (MK Dons) is shown the yellow card for a bad foul. Jay Emmanuel-Thomas (Queens Park Rangers) wins a free kick in the attacking half.